The Osprey is a species of bird of prey that is unlikely to ever be brought into the Sanctuary here in Mid-Suffolk: not only is it rare to these shores as a whole but because our regional terrain here is devoid of suitable hunting grounds and nesting environments, which are coastal or situated near any lake or river which is free from disturbance and where fishing is possible. As a result we've never run a story on this fascinating bird, but a recent feature in The Daily Mail featuring some amazing photographs by Miguel Lasa, a 49-year-old award-winning photographer who works as a family doctor in north-east England, prompted us to contact him for permission to reproduce them for your benefit. 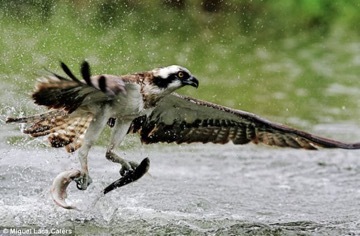 The Osprey is a specialist fish-eater which will plunge into the water from about 30ft for his food. Ospreys' feet are specifically adapted to the purpose - they have long, sharp, very curved talons and the undersides of the feet are covered in tiny spikes, which act rather like velcro-fasteners. Ospreys are able to turn their outer toes to the rear, so giving them two opposing pairs of talons to accomplish their challenging hunting task. Sometimes known as a fish hawk, they begin their hunt by hovering as they search for prey - normally salmon or trout - in the water, before executing a dramatic, near vertical, feet-first plunge. Compared to its body weight of up to 4.51bs, the Osprey has very large wings, with a span of almost 6ft. These it uses to lift both itself and its prey - both soaking wet - from the water's surface, hanging in mid-air after a few strong wing-beats to shed water with a characteristic shake of its body, before flying off to feed. Ospreys are migratory birds which winter in Africa and southern Europe and migrate northwards during the summer to breed and feed new chicks with fish. They were persecuted to extinction in Britain by 1917 but their British comeback started in 1959 when a pair returned and bred successfully at Loch Garten in Scotland where now about 110 pairs return each year. More success has been enjoyed further south as Ospreys have returned to Rutland Water and been encouraged to breed there. Miguel travelled to Finland to capture the behaviour and action of fishing ospreys during the summer. "I took the photographs from a bird hide and waited to photograph them from 6am to 8pm every day for seven days over four summers. I used high camera speed frames and fast focus to freeze the dives and splash.